Thanksgiving Confessions: Which recipes, tips did you use? Now that we've sent the Thanksgiving frenzy to the back of the pantry for another year, I was wondering how it went. Post a comment and let me know which ones you used or what you'd like on the menu for next year. I'm headed off on my annual Thanksgiving break. I've got pies to bake and miles to travel. But before I hit the road, I wanted to leave you with one really great recipe. If you have a houseful of guests this week, a leisurely breakfast you can make in advance may be just the ticket. My suggestion: Club soda waffles. Seriously. If you've never made them, club soda makes waffles that are fluffy inside and wonderfully crispy outside. You can make them in advance, toss them in the freezer and they'll recrisp nicely in a toaster oven. The recipe doesn't call for any fancy touches like beaten egg white or yeast raising. As long as you've got some fresh club soda (unopened bottles have more bubbles), you've probably got everything you need for these. 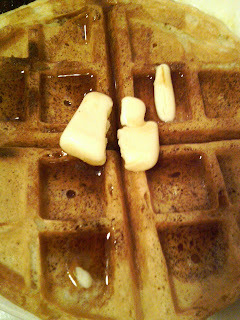 My picture didn't turn out great, but the waffles will. Here's hoping everyone has a Lake Woebegone Thanksgiving: All the pies are outstanding, all the side dishes are satisfying, and all the turkeys are above average. Whisk together the flour, sugar, baking powder and salt. Add the butter, eggs and seltzer and whisk until smooth. Heat a waffle iron. Brush it with oil if it isn't nonstick. Pour about 1/2 to 2/3 cup batter on the grids. Close the waffle iron and bake until browned and crispy. Serve right away, with butter and maple syrup, or place a warming rack over a baking sheet and keep the waffles in a warm oven until they're all ready. Or cool them, slide them into a resealable freezer bag and freeze. Reheat in a toaster oven. Doing your Thanksgiving shopping Saturday? The Matthews Community Farmers Market holds its last regular-season market Saturday from 7:15 a.m. until noon. They'll do a special Thanksgiving market from 4 to 6 p.m. Tuesday. The market won't open next Saturday, and will start the every-other-week winter schedule on Saturday, Dec. 4, from 8-10 a.m. The market is on North Trade Street in downtown Matthews. The Davidson Farmers Market is open from 9 a.m. to noon Saturday. It won't be open again until Dec. 4. The Atherton Market is also open Saturday at 2104 South Blvd. The Common Grounds Farm Stand, 923 Providence Road (next to Interior Marketplace near Providence and Queens) is also open Saturday frin 9:30 a.m.-2 p.m. Proceeds from their sales benefit the Urban Ministry Center. The Community Culinary School of Charlotte will hold a holiday bake sale from 9 a.m.-1 p.m. Tuesday, at 2401 Distribution St. They'll have pumpkin pies, sweet potato pies, fruit pies, layer cakes, cookies, yeast rolls and more. Pie prices range from $10 to $14; cakes are $14 to $16; rolls are $3 per dozen. CCSC is a nonprofit organization that provides training and job help in the food service industry for adults who have had problems with employment. Between the magazines, the cooking shows, the food Web sites and -- yes, we're guilty -- the newspapers, it's easy to get caught up in Thanksgiving panic. Make it bigger! Make it fancier! Make it the most special Thanksgiving of all time! If you're not milling your own flour for pie crusts, you're not going to have The Best Thanksgiving Ever. You know what? Thanksgiving comes every year. It came last year, it will come next year, and it will be fine this year. Maybe it's a good time to step back and make a simple dish, something earthy and comforting. Something satisfying with no loaded expectations attached. I found this Slow Cooker Beef Stew in the most recent issue of Cook's Country magazine. Like all of America's Test Kitchen recipes, it has a fussy touch or two. But nothing difficult -- I put it together one morning before I left for work, and was rewarded by coming home to a satisfying dinner on a chilly, rainy night. One of the wrinkles is a great tip for slow-cooker fans: Use Minute tapioca as a thickener for slow cooker sauces. Unlike flour slurries or cornstarch, it won't break down in the heat. The method of wrapping the vegetables in foil and placing them on top of the cooker keeps the vegetables from getting too soft and lets you season them separately. And stirring in the peas at the end keeps them green and appetizing. 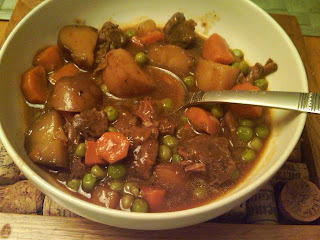 As always, I made changes: I skipped the parsnips because my husband doesn't like them (pity -- I love their sweet flavor), and I used stew beef from Gilcrest Natural Farms. Cutting your own chuck roast would be cheaper, but would take a bit more time. Instead of a 6-ounce can of tomato paste, I used a healthy squirt from a tube of paste. It all turned out just fine. And so will Thanksgiving. From Cook's Country, December/January issue. Pat beef dry with paper towels and season with salt and pepper. 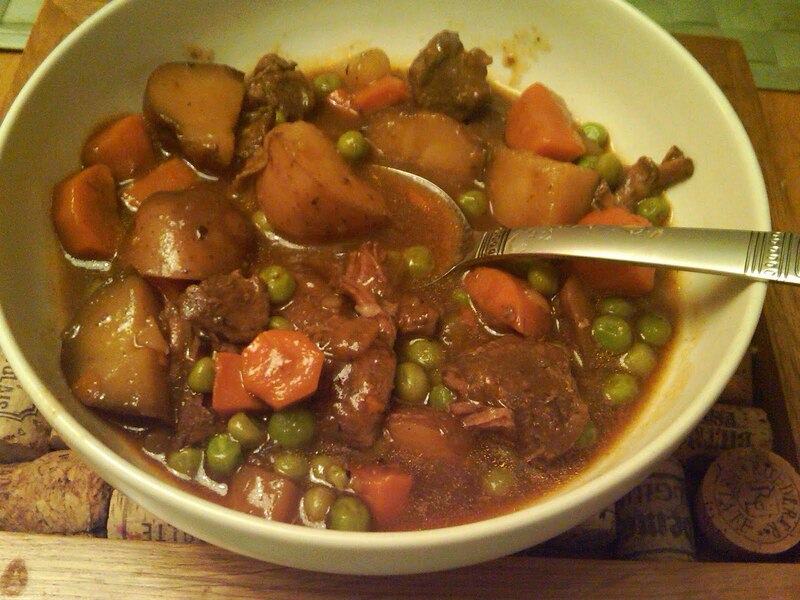 (If using prepared stew beef, cut into bite-size pieces.) Heat 1 tablespoon oil in a large skillet over medium-high heat until just smoking. Cook half the beef until well browned all over, 5 to 8 minutes. Transfer to slow cooker. Repeat with additional 1 tablespoon oil and remaining beef. Add onions, 1/4 teaspoon salt and 1 tablespoon oil to skillet and cooked 6 to 8 minutes, until softened and a little browned. Add tomato paste and cook, stirring often, until paste begins to darken, about 2 minutes. Stir in broth, soy sauce and bay leaves and bring to a boil. Add to beef in the slow cooker. Stir in the tapioca. Cover the slow cooker and cook on high for 6 to 7 hours or on low for 10 to 11 hours. Uncover and remove the foil packet to a bowl or cutting board. Discard the bay leaves if you spot them. Open the packet and pour all of the vegetables and any cooking liquid to the slow cooker, stirring to mix it all in. Cover and heat about 30 minutes. Stir in the peas 5 to 10 minutes before serving. Now here's an e-mail to warm a food editor's heart: Gary Kunes wrote this morning to tell me that his 12-year-old daughter, Evie is "a cookie baking machine." "Lunch at school is before 11 a.m., so she is hungry when she gets home at 4:15. So she makes sure there are always cookies in the house." After he showed her my Wednesday story on whoopie pies, Evie got to work making winedrop cookies (don't worry, no actual wine is used in the making of the cookie.) Gary got her permission to fill the cookies with a filling for impromptu whoopies. That's Gary's picture above. 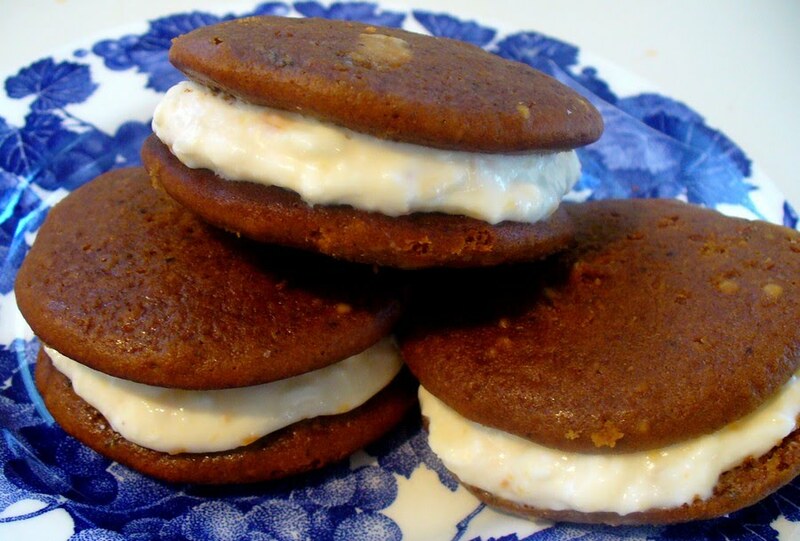 "I figured cream cheese mixed with homemade apricot jam would pair well with the clove, cinnamon, etc., spices in the cookies. I was right! Thanks for the inspiration." Why no, thank you, Gary. Inspiring 12-year-old bakers and their dads is what we live to do. Meanwhile on the whoopie front, I heard from a few more bakers doing the whoopie thing. Suarez Bakery at Park Road Shopping Center says they make them all the time, including a special holiday flavor, chocolate peppermint. And Miss Ms Sweets at Afton Village in Concord also makes them. You can get those details at http://www.missmssweets.com/. And here's Gary Kune's (and Evie's) recipe for winedrop cookies. You're on your own for the filling. BEAT together. Spoon out onto baking sheets and bake at 375 degrees for 8 minutes. Pumpkin pie vs. sweet potato: How do you make the call? They're both dark orange, they both have smooth consistencies that are the perfect contrast with flaky crust, and they both taste mighty good under a crown of whipped cream. So how do you decide which pie to have for Thanksgiving, sweet potato or pumpkin? Pumpkin has that fall-harvest connection, but it's too often relegated to frozen-pie status. It's like we feel the obligation but not the motivation. Sweet potato pie recipes usually have family roots, but it gets so spiced and sweetened, it loses its connection to the fields and becomes just another delivery system for melted marshmallows. Personally, I skip the debate and go with pecan. It's in my Georgia roots. Or I try to find the best of both worlds with a pumpkin pie topped with sweetened pecans, for that creamy/crunchy/nutty contrast. But in the run-up to Thanksgiving, I'd love to hear which way you go and how you make the decision. What's your pleasure - pumpkin or sweet potato?